I've recently switched to using the Microsoft Touch Mouse. It's a Windows 7+ only piece of hardware. 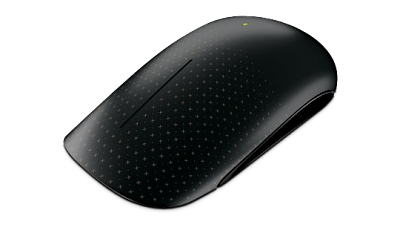 The entire top front of the mouse is a multi-touch sensor. It only has one physical button (the whole thing, ala the Apple mice) but based on where you press down it registers either a left or right click. The hardware is amazing, up to Microsoft's usual high standards of build quality. The software however is lacking in many ways. It has huge potential. I'm hopeing that with udpates the experience will get better, but so far Microsoft has failed to deliver. As it is, it's rather frustrating to use for anything but basic mouse actions (at which it excels). My primary pointing device is a Logitech Trackman Wheel. I switched to using a thumb based trackball after using a full handed trackball gave me worse RSI than the mouse I was trying to get away from. However, I find switching between the two on a regular basis works well for me. The main source of pain in my arm is the muscles responsible for finger lifting. This is why the thumb based trackball works so well for me. My fingers rest on the buttons and only my thumb is used. The Microsoft Touch mouse has no buttons. So to register the difference between a left and right click, your fingers must be off the mouse so that a touch, not a press, can be registered before you press down to click. This is horrible ergonomics. In fact, everyone who tried this mouse said that right clicking was next to useless. That, and the complete lack of middle mouse button was incredibly frustrating for me. Overall it was a nice design exercise for someone in Microsoft's hardware division. Ultimately though it fails to be a useful pointing device.